I was so excited to find and read this book! Right now I'm on a wave of wanting to learn as much as I can about cooking from scratch and self sufficiency and this book is a real treasure trove of information. I have to comment first though on the book itself - it is gorgeous! With a blue linen like edging and then a matt photograph design on the cover, I love it! It just looks like a book you put on display - top quality. The photography and layout inside is also very impressive! Now to the inside. The book begins with Anya sharing her story so we can see how she got to the place of writing this book. I love reading books by people that are passionate about a subject as they make it so interesting - this is no exception! Just about every recipe has illustrations beside them. Her influences are Italian and perhaps Northern African as that is where she spent a lot of time. She shares about the different things in Italian culture that influenced her. She teaches how to do things and why, for example: 'Throwing the best party' giving details for a dinner party. An example of some basics she starts off teaching you how to make are tallow, bone broths, lard and buttermilk. This is home cooking in it's element! 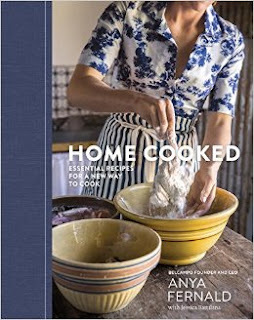 I'm very excited to receive this book and am so inspired to try many of the recipes. I will return to update my review after I have tried several recipes to let you know how they turn out. Overall I highly recommend this book! It would make an amazing gift too! Please note that Blogging For Books sent me a copy of this book for my review - however this review is entirely my own.